If you feel pain in your tooth when you bite down or chew, you might have cracked tooth syndrome (CTS). Adelaide Dental can examine you to determine why you have pain on biting down and provide you with pain relief. Cracked tooth syndrome (CTS) is a condition in which a crack extends through the tooth dentin, which is the layer underneath the tooth enamel and above the tooth pulp. This condition most often occurs in lower molars, which endure the brunt of chewing. The crack may be microscopic and may not be visible to the naked eye. Cracked tooth syndrome can be caused by a variety of factors, including wear and tear, grinding, clenching, or biting into a hard object. What are the symptoms and risks of having cracked tooth syndrome? Cracked tooth syndrome (CTS) symptoms include cold sensitivity and not being to use the tooth for chewing. If not treated, CTS may result in nerve damage and in the crack spreading throughout the tooth structure. Until you are able to see the dentist, you should keep the area clean by rinsing with salt water and avoid chewing on the affected tooth. If you are in pain, you can also take an anti-inflammatory such as Advil, unless you are allergic. The dentist must determine the reason that you developed cracked tooth syndrome before recommending a course of action. The prognosis will depend on how far the crack has spread throughout the tooth and on whether or not the crack has reached the root. 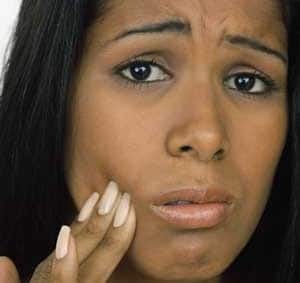 It may be necessary to adjust the bite in order to reduce pressure on the tooth.